It’s only day two of the Starwood-sponsored “Meet Me in Hawaii” Honolulu FAM trip and I’ve had to forcibly stop myself from gasping overwrought exclamatory adjectives every five minutes. The views — mountain-punctuated stretches of pure, sparkling turquoise — are hard to take your eyes away from and the weather — breezy, comfortably warm, and humidity-free — is perfect. 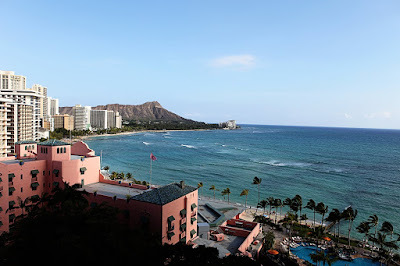 My group, a few members of the media and a handful of meeting planners, is staying at the Sheraton Waikiki, a newly renovated 1,636-room property perched on a popular stretch of Waikiki Beach. After three years and $187 million worth of upgrades, the hotel’s new pool complex, four restaurants, Spa Khakara, and revamped 45,000 square feet of meeting space are a stunning departure from the Hawaiian hotel of yesteryear — when flower prints bigger than your head and kitschy, splashy colors made your eyes sore. Refurbished guest rooms, lobbies, and meeting spaces are outfitted in clean, dark woods, soothing neutral colors, and local artwork. Bliss amenities line the sinks (flanked by plantation shutters if you like to peek at the ocean while you get ready), while open-air lobbies and plenty of retail shops on the main floor provide a bustling hotel center. 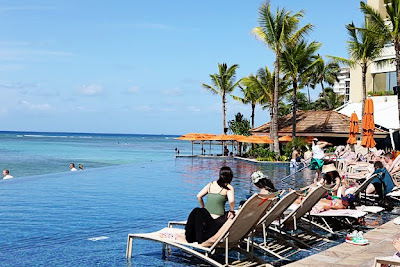 Fortunately the property has not lost its marks of local culture: Sustainably farmed produce from nearby farms dominate the menus at the new Kai Market and Rum Fire restaurants and traditional ukulele concerts and hula dances are daily events next to the infinity pool. 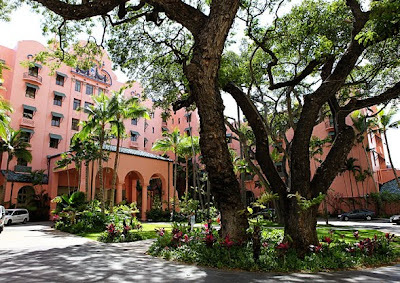 Next door, the famed 529-room Royal Hawaiian, reopened in 2009 after a $60 million renovation and rebranding, is a historic treasure with an Old World ambiance that has hosted everyone from Agatha Christie to Elizabeth Taylor. 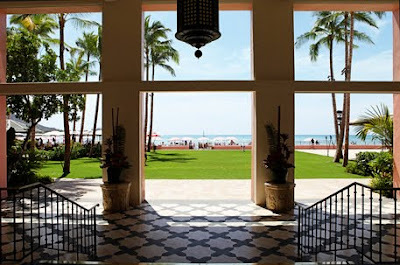 Much of the hotel’s design and architecture from its 1927 opening has been painstakingly maintained and the fun pink theme running throughout (everything from the bathrobes to the exterior are pink) makes the property an easy one to spot on busy Waikiki Beach.